The enormous rhinoceros Elasmotherium sibiricum, sometimes referred to as the “Siberian unicorn”, on account of its massive, single nose horn, survived until much more recently than previously thought. In a new study, published in the academic journal “Nature Ecology and Evolution”, a team of international scientists conclude that E. sibiricum survived in eastern Europe and central Asia until at least 39,000 years ago. It probably finally died out sometime around 36,000 years ago. Furthermore, the study has resolved a long-standing debate amongst palaeontologists as to the taxonomic relationship of rhinos like Elasmotherium with their living, distant relatives. A life reconstruction of Elasmotherium sibiricum. The research team which included scientists from the Oxford University, the University of New South Wales, Adelaide University, the London Natural History Museum, Groningen University (Holland) and the Russian Academy of Sciences, conclude that although, this more than three-tonne giant lived at the same time as Neanderthals as well as modern humans, hominins probably played very little part in its eventual demise and extinction. Instead, it is likely that climate change, resulting in the reduction of the steppe (grasslands), on which this rhino grazed, led to the extinction of Elasmotherium. There are only a handful of rhinoceros species living today, all of which are faced with extinction. The extant rhinos are just the remnants of a huge and very diverse sub-group of “odd-toed” hoofed mammals (Perissodactyla). Elasmotherium is known from numerous fossils from China, Russia, Kazakhstan and Mongolia. As part of the research, a genetic analysis of collagen extracted from Elasmotherium bones was undertaken. The DNA data revealed that Elasmotherium was the last surviving member of a unique family of rhinos. The DNA analysis showed that a divergence between the Elasmotherium and other rhino subfamilies started taking place in the Eocene Epoch (between 56 and 34 million years ago). This new genetic evidence overturns previous studies that suggested the Siberian unicorn was a very close relative of the extinct woolly rhino (Coelodonta antiquitatis) and the living, but critically endangered, Sumatran rhinoceros (Dicerorhinus sumatrensis). It had been thought that Elasmotherium became extinct around 200,000 B.C. 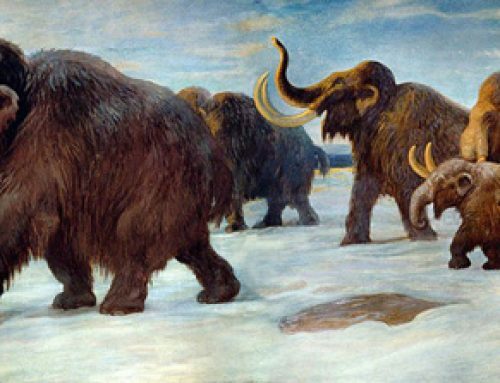 well before the last Ice Age event in the northern hemisphere and many tens of thousands of years before the Late Quaternary megafaunal extinction event, which began around 130,000 years ago. Radiocarbon dating of twenty-three individual specimens indicate that E. sibiricum survived in eastern Europe and central Asia until at least 39,000 years ago and possibly as late as 36,000 years ago. Isotope data taken from fossil teeth indicate that this giant rhinoceros lived on the dry steppe and had a highly specialised diet, which probably contributed to its eventual extinction. As the last surviving member of the Elasmotheriinae, the extinction of E. sibiricum marked the termination of this part of the Rhinoceros family tree. Other species that shared the Siberian unicorn’s environment were either less reliant on grass, such as Coelodonta antiquitatis, or more flexible in their diet , like the saiga antelope and escaped the Siberian unicorn’s fate, although the C. antiquitatis eventually became extinct some 20,000 years later. Everything Dinosaur announced earlier this month that they would be stocking a 1:20 scale model of Elasmotherium sibiricum (CollectA Deluxe). The CollectA Deluxe Elasmotherium model. Everything Dinosaur acknowledges the assistance of a press release from the University of Adelaide in the compilation of this article.